Over the next two weeks, three Dartmouth alumni — Susan Dunklee ’08, Emily Dreissigacker ’11, and Max Durtschi ’15 — will represent the United States at the IBU Biathlon World Championships in Oestersund, Sweden. Read more about the team and the upcoming competition, which runs March 7–17, 2019. Last year we caught up with Durtschi, a Ketchum, Idaho native, about his love of sport. Durtschi grew his athletic strengths and scientific curiosities exploring the Rocky Mountains of the American West. Before graduating from high school he had signed his first professional contract as a cyclist, racing across the world as he balanced his professional cycling career with his academic career. At Dartmouth, Max began to rekindle his love of winter sport. 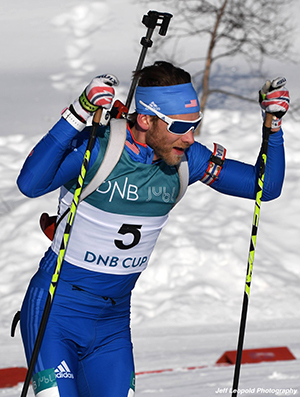 Within a year of trying biathlon, a sport that combines cross-country skiing and rifle shooting, he was named to U.S. Biathlon’s National Development program and earned a full-time residency at the Olympic Training Center in Lake Placid, NY. How did Dartmouth help prepare you for the intense world of competitive sports? Dartmouth provides a welcomed departure from the sporting world. The professors, deans, and students challenge me to engage intellectually, which is really refreshing. I am grateful that I have the opportunity to participate in both academics and athletics. Each challenge me in a different way and complement each other well. Dartmouth is a special institution, filled with mentors who have consistently encouraged me to pursue all of my goals. I can’t express how grateful I am for their flexibility and guidance as I have navigated my academic and athletic careers! You carry your late friend Willie Neal’s rifle, and credit him with getting you involved in biathlon. How has the sport helped you grieve his death? Willie Neal was a remarkable young man who inspired me, and everyone around him, to be a better person. Though he has passed, his family continues to inspire those who were touched by Willie and the impact of the Neal family goes way beyond sport. I really do carry Willie with me. During biathlon events, I do so by harnessing his rifle, but to be honest, I carry him with me just about all the time. His memory, and his family’s example, push me to be a focused athlete and more importantly a compassionate person. Your history as a three-sport athlete has taken you around the world and across five continents. What’s the most valuable lesson you’ve learned from competing in such varied locations? Traveling abroad consistently reminds me of how unique the United States is in terms of our sheer size and diversity. We truly are “the great experiment.” The most valuable lesson that international travel has taught me is how important it is that, as Americans, we continue to tackle the hardest challenges that face humanity today. The world is watching and, at our best, we can lead by example.